Repeat Row 2 as many times as you need to make dishcloth in size you prefer to use. When you finished last row don’t fasten off, but continue to work (ch2, 2 dc in same ch-2 space, sc in next ch-2 space) around the dishcloth to make the edging look nice. Came over from Flicker… LOVE the pattern for your dishcloths. I make lots of them to give away as baby gifts, and I'm always looking for a good pattern to use. I come from Germany and I like your TWO COLOUR BABY BOOTIES so much. My English has got rusty a little bit. But I learn again. Hi there, thanks so much for posting this pattern with images. I’ve made a few attempts at this dishcloth and when I get to rows 3 or 4, the band begins to curve a bit (the initial row is much tighter than the current row I’m working on, thus the curve that should appear straight across). Any suggestions? I thought about using a larger hook for the first 45 chains and then move to a smaller hook, in hopes this would even the dishcloth out. Many thanks! 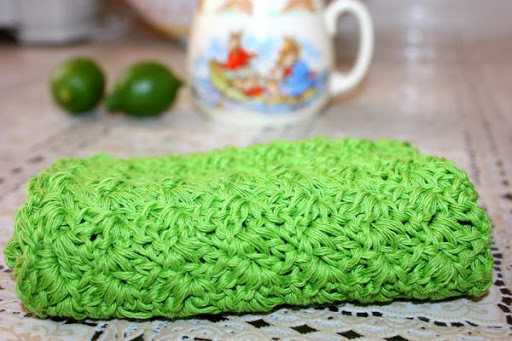 What are the dimensions of the finished dishcloth?